Home » Personal Finance » Do You Need Credit Monitoring to Protect Your Credit? While the internet has improved our lives in numerous ways, technology has also made our personal information more vulnerable than ever. If data breaches from big stores like Target and Home Depot several years ago didn't convince you of this fact, the 2017 Equifax data breach, which may have released the sensitive data of up to 145 million consumers, probably helped you realize how much peril your personal information could be in. During the Equifax data breach, consumers' names, Social Security numbers, addresses, and, in some cases, credit card numbers were accessed by hackers. To control damages after the breach, Equifax created a special website where you could enter your information and find out if you were affected by the Equifax breach. It also began offering a year of free credit monitoring and other identity theft services to all U.S. consumers, whether their information was accessed during the data breach or not. In addition to taking advantage of credit monitoring, Equifax and consumer advocates suggested consumers consider several other steps to protect their credit right away: freezing their credit reports and placing a fraud alert on their reports. But what's the difference between these options? While each service has the same goal of protecting your identity and your credit, they all work differently and some may be better for some consumers than others. Traditionally, credit monitoring is a service people pay for. With LifeLock, for example, you can pay a monthly fee to have the company continually check for fraud or threats to your financial accounts and credit reports. Other credit monitoring services work similarly, although they may offer different features. With a credit freeze, you usually pay up to $10 per credit reporting agency to make your credit report inaccessible to lenders, thereby making it impossible for hackers and scammers to open new accounts in your name. Note that you usually also pay a fee every time you want to unfreeze your credit. For now, credit freezes and unfreezes are free with Equifax. Initial fraud alert: This type of fraud alert is best for someone whose identity hasn't been stolen yet. It protects your credit from unverified access for up to 90 days. Extended fraud alert: An extended fraud alert protects victims of identity theft for up to seven years. Active duty military alert: This alert protects active duty service members from identity theft for up to one year while they are on deployment. Whether you should pay for credit monitoring depends on your situation. Gerri Detweiler, education director for Nav, a company that makes tools for managing business credit, says that while there are more opportunities than ever to monitor your credit for free, there are times when paying for a more comprehensive service could be advantageous. "The monitoring on these platforms can be more robust," she says. If you know that you will not take the time to monitor your credit accounts yourself, or you just want the peace of mind of knowing someone else is doing it for you, then paying for a subscription service may be worth it. Freezing your credit report can also make sense, says Detweiler. But if you're doing it to prevent identity theft, you need to know the drawbacks. "It can be a hassle when you go to apply for credit, insurance, or even try to get a new cellphone," says Detweiler, mostly because you will have to unfreeze your credit report any time you want to apply for new credit. That can get costly. Detweiler says she also worries that credit freezes create a false sense of security. While a freeze can prevent someone from opening new accounts in your name, it can't prevent hackers from using your existing accounts fraudulently or stealing your information. As far as fraud alerts go, Detweiler chose this option when she was a victim of identity theft in 2017. While a credit freeze locks down your new credit, fraud alerts allow creditors to access your credit report as long as they are able to verify your identity. For this reason, fraud alerts may be a better option for someone who opens new credit regularly and still wants some protection against identity theft. If you are preparing for a crucial loan like a mortgage, new auto loan, or small business loan, for example, you want to make sure your credit is as solid as possible, says Detweiler. That's because lower credit scores may mean you won't get approved for the loan or you'll pay more in interest charges. Plus, you'll want to keep your identity and personal information safe from hackers and scammers no matter what. If your identity is stolen, it can take months or even years to get the situation cleared up. There are also plenty of places where you can get a free credit score. Many credit card issuers give out free credit scores. Other free services such as Credit Karma give you an estimate of your credit score year-round and set up notifications to let you know when a new account is opened in your name. Keep a close eye on your bank accounts. "If you notice unauthorized activity on your account, immediately call the number on the back of your debit, ATM, or credit card, or stop by your local branch," says Buxton. Sign up for alerts on your accounts. Many banks let you set up your credit and debit accounts so you're notified any time a purchase is made. Spread your free credit reports over the course of a year. 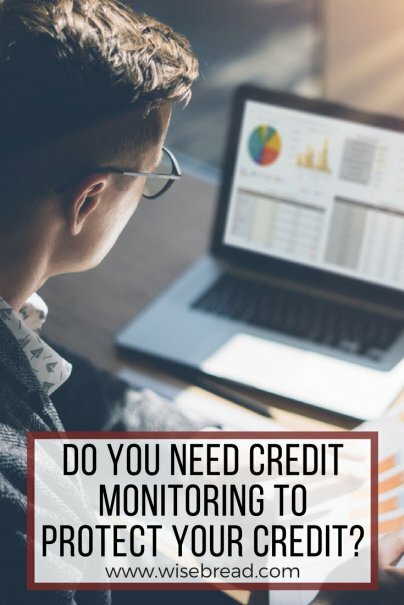 Since you can get a free report from the three credit reporting agencies once per year, Buxton suggests spreading those out by accessing one free report every four months. Notify credit reporting agencies of any false reporting. If you find any errors on your credit report, notify the credit reporting agency in question and dispute the information right away. You can find out more about how to dispute errors on your credit report on the FTC website.